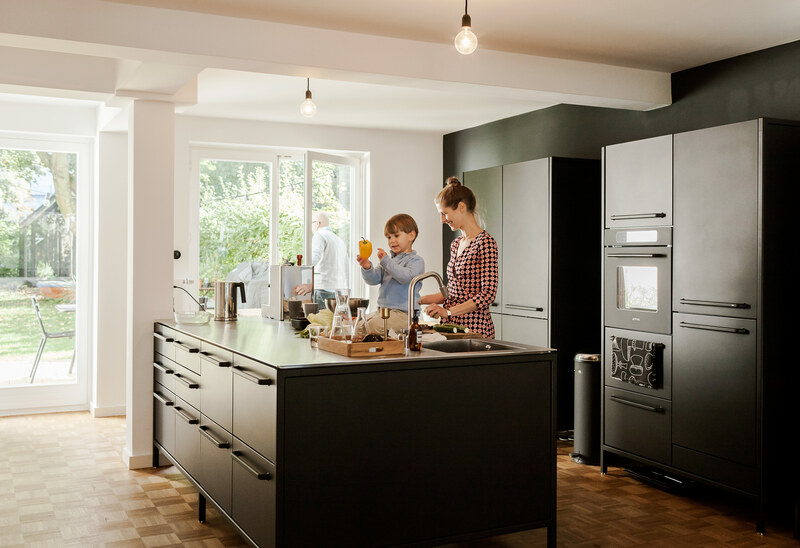 A black-matte kitchen system from Vipp is the centerpiece of the Hamburg apartment of Fabian and Dorothee Heine. The island serves as a generous workspace for Dorothee to prepare dishes with her son Morten. Morten Bo Jensen, the chief designer at Vipp, has the brand's kitchen system in his Copenhagen home. He explains that his role as chief designer at Vipp is to “work with their DNA” by refining the company’s trademark materials: stainless steel, painted metal, and rubber. For the utilitarian kitchen, “we wanted to get the feeling of a tool,” he says. “It’s nice to have a space where you can actually work.” The gas stovetop is by ABK and the refrigerator is by Smeg; Le Perroquet spotlights are from iGuzzini. In 2015, Vipp introduced a 592-square-foot prefab unit called Shelter. It's equipped with a freestanding island from the brand's kitchen line. Lisbeth Juul and Laust Nørgaard also selected a Vipp system for their 860-square-foot floating home on the Copenhagen waterfront. They chose this kitchen for the simplicity of its design and because it rests on slender legs rather than a monolithic base.